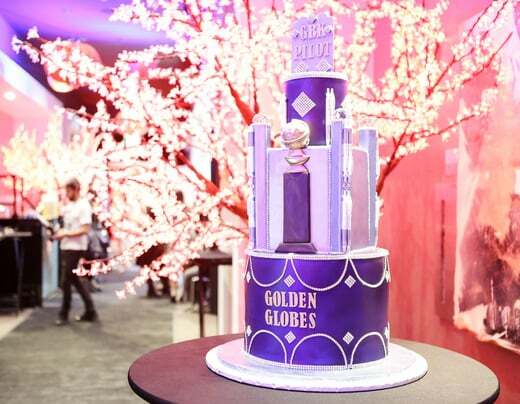 From luxurious trips to St. Martin to spin classes at The Sweat Shoppe, guests at the GBK Golden Globes gifting lounge had it all! Presented by GBK and Pilot Pen, guests arrived at The W Hotel in Hollywood to prep for awards night. Pilot Pen was the title sponsor over the highly anticipated awards lounge. Offering exceptional writing instruments that range from everyday pens to high end work of art fountain pens. Onsite, Pilot Pen featured box sets of the old Japenese art of Maki-e, which were made of real gold pieces and included a gold fountain tip, and ranged from $7,500-8,500. Guests received pouches of Pilot Pens top sellers. Life Cell creates an all-in-one anti-aging treatment! Simply Put...A MUST HAVE! Created to get a jump start on creating a healthier you for the new you were other presenting sponsors: Freedom Quit Smoking System, iRestore Laser Hair Growth System, LifeCell, and TheScienceofEating.com. Freedom Quit Smoking created a nicotine free method to kick the habit. iRestore Laser Hair Growth System is a proven hair loss treatment for both men and women. With tons of products on the market, the iRestore Laser Hair Growth System is one of only four products of its caliber in the United States with FDA clearance. LifeCell created a genius all-in-one anti-aging line of products. From cleaners, body butters, face moisturizers and more, LifeCell is a great way to get a start on restoring your skin to a youthful natural glow. Formed to bring together artists and entertainments, The Creative Coalition discusses pressing issues to educate the community and nation. Food on Foot is a non-profit organization that strives to provide the poor and homeless of Los Angeles with the assistance they need in order to successfully move off of the streets. Food on Foot does monthly events with local volunteers to help drive the movement. Lamda Legal was on sight to spread its mission to achieve full recognition of the civil rights of lesbians, gay men, bisexuals, transgender people and those with HIV. Launched by boxing legend, Sugar Ray Leonard, the Sugar Ray Leonard Foundation, is to benefit Juvenille Diabetes Research. Through hard work and education the foundation strives to fin a cure for juvenile diabetes. Allison Holker Snagged a Pair of Tweezers From Tweezerman! Made in California, American Hat Makers showcased their handmade leather hats. From hipster caps to cowboy hats, guests were able to play dress up and take home their favorite. Making the perfect on-the-go necessity, beauty tool experts,Tweezerman, gifted its pocket sized, travel-friendly tweezers which can easily slip into your pocket or purse. The Artisan Group gifted attendees an array of: bath products, jewelry, candles, and more. After a long weekend of events prepping for the big night, the Golden Globes, a few days of spa pampering would be great! Burke Williams gifted guests with a 3-day spa pass to come relax and enjoy all of the spa amenities. After an evening of pampering compete the pampering in your home and enjoy a great nights sleep with silk pillowcases by Shhh Silk! Truly Yours Parfums showcased its latest scent, Reisa! A highly desired combination, the new scent is a mix of citrus and floral mixed with a hint of wood undertones. Complete with a custom etched bottle with rose gold accents and a metal label, Reisa, makes the perfect gift for your loved one! Whether you are single or have that special someone, L'amourose was on site showcasing it's top-tier line of adult toys. Delivering high-quality long-lasting toys, L'amourose is one of the best in the market. 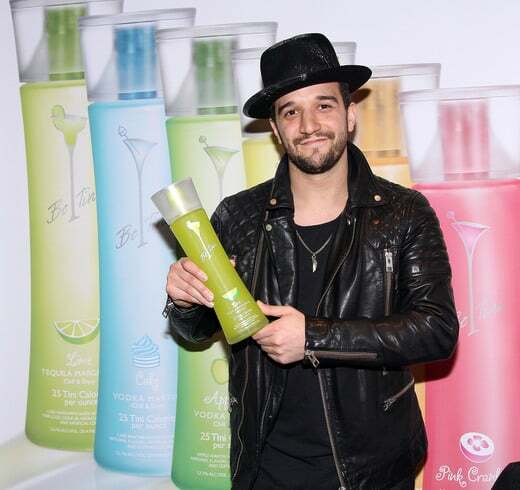 Mark Ballas Enjoying Be Tini Spirits! Guests were able to sip on premium grassed organic bone broth by Au Bon Broth , munch on delicious sandwiches (good for any diet) by Ike's Place, enjoy premium prepared cocktails by Be Tini Spirits and desserts by Bread Basket Cake Company and Jönes Gourmet Gelato, while enjoying beats from DJ Shy! Additional sponsors include: Beija-Flor Jeans, BoomCase, Couch Potato, Cynthia Gale New York, Hale Bob, Hayari Paris, Paula's Choice Skincare, Relief Bed, Enchanted Sweet Shoppe, Trtl Pillow and more. In addition to media many celebrities attended the event. Guests include: Anthony Anderson, Gina Rodriguez, Miles Brown, Dule Hill, Breeda Wool, Nico Santos, Matthew Willig, Scout Taylor-Compton, Sam Richardson, Allison Holker, Mark Ballas and more. Kicking off 2016 right the GBK and Pilot Pen gifting suite gave attendees tons of goodies! From luxurious trips to life-changing products this gifting suite had it all!